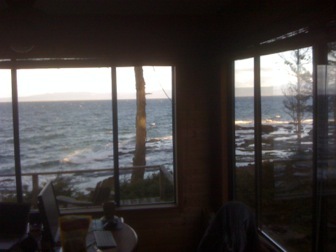 Tribune Bay on Hornby Island. Grant's home is on the sandy bay to the right of the large bay, just past the small point. Getting to the main Institute location is quite an adventure, involving three ferries from the British Columbia mainland (or just two if you fly to Vancouver Island). You will have a chance to meet a number of the core Institute people at the island where we live. If you are thinking about getting involved with the Institute, this would be an unusual opportunity to do so in a relaxed and informal way. Our Facilities: We don't have a central office facility. Instead, we work out of our homes. And we are often off-island working or teaching. Thus, you need to let us know ahead of time if you wish to stop by for a visit. For training workshops or healing sessions, you also need to coordinate accommodations with us ahead of time. Accommodations: For those of you with an adventurous bent, you are welcome to tent (for free) on Grant's lawn next to the beach, except from July 1 to Sept 1 when he isn't at his home (however, this is Canada - the weather is very bad from November to April). Or bunk inside, either on the floor or with one of the other teachers here on the island. There is also a variety of bed and breakfasts nearby. If you are here for the clinic, we have a cottage conveniently located right next to it for your use. Activities: There are extensive mountain biking trails, and a bike rental place within a short walk of Grant's home where the workshop will be. Several cafes are also within a short walk. Seals, eagles, and other wildlife are everywhere on this island, as well as a kayak rental company that launches just a few hundred feet from the house. Half the island is forested park. Many beaches surround the island. You are welcome to stay longer to enjoy the island, If you are hear for a training, this would be a good opportunity to do more work on the material if that feels appropriate for you and us. The advantage to coming here to our homes is that we don't have to rush off to catch the flight back home! 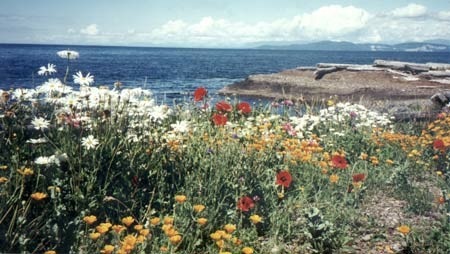 If you can, we strongly recommend exploring the gulf islands while you are here. The trainings are before the full tourist rush, so although there will still be a number of people traveling, it isn't quite the problem that July 1 brings to our island homes of no available accommodations and overcrowded ferries. Food is also informal. During workshops, you can fix food at my house, but I highly recommend the atmosphere and food choices at the cafe's that are about 5 minutes walk from Grant's home. The food is excellent and reasonably inexpensive ($6 to $8CN or about $4 to $6 US) per meal. Plus music and other cultural events occur continuously in the summer. A park about 6 minutes from Grant's house. What to wear: Weather in the Gulf Islands can vary between idyllic (in the summer) and cold and wet (anytime), unpredictably. Bring some sort of rain gear just in case. The beach that Grant's home is on is clothing optional in the summer, so if you forget swimming gear, not to worry. However, other beaches on this and the rest of the Gulf Islands are not so relaxed, so you'll need appropriate clothing for them. Don't forget a towel for the beach. How to prepare for training classes: We highly recommend reading the material on the website about Whole-Hearted Healing. Reading our book Peak States of Consciousness will make your experience much more meaningful and valuable, as you'll at least have an understanding of what we're about, as well as what you don't understand. If you are a therapist or planning on doing healing work with people, I highly recommend purchasing our Basic Whole-Hearted Healing Manual for reference. Don't bother if you are a layperson, as the basics can be had for free by downloading from our website. What you can expect to accomplish from a training class: As with anything, what you get depends on what you put into it and some luck. If you prepare ahead of time, your experience will be richer and more useful. You will be using trauma healing techniques which are applicable to any situation in your life, and can be done on yourself by yourself at home. There are no guarantees, but at a minimum you will leave with an understanding of what you need to continue working on when you get home! Pacific Coastal Airlines 1-800-663-2872, www.pacific-coastal.com,10 day advance $93CN, 3 day advance $123CN, no advance $155CN o/w - this airline requires you take a shuttle bus to their plane. Central Mountain Air, 888-865-8585, 250-847-4780, www.flycma.com, first come first serve $83CN, $98CN, $115CN o/w - this airline has a gate at the main terminal. From other cities in Canada, Westjet 1-800-538-5696, www.westjet.com; and also from other cities in Canada, Air Canada, 1-888-247-2262, www.aircanada.ca (they use Central Mountain Air to connect through to Comox). From there, you can take a bus, rent a car, or we can do a pickup to get you to the ferry terminal at Buckley Bay which will take you to Denman Island. The ferries run every hour on the hour. The last ferry to Denman leaves Buckley Bay at 11:00PM, but the last Hornby ferry leaves Denman at 6:35PM, so if you arrive into Comox after 5PM you'll need to plan on staying in Comox or Denman, if you can get there via bus or taxi or car. (We might be able to arrange a sleeping at Wes Gietz' home in Comox, perhaps.) If you get stuck on Denman, the local youth hostel is a 10 minute walk from the ferry terminal and their phone is 250-335-2688, www.earthclubfactory.com. You cross to Denman, then cross the island (about a 10 minute drive) to the ferry terminal to Hornby Island. And yes, the ferries have gotten pretty small by this leg of your trip! Ferry cost for car and driver is about $33CN ($24.50US) roundtrip, (unless you buy a coupon book, ask at the ticket booth) although if we pick you up it's a lot cheaper ($7CN r/t)! When you arrive on Hornby, you follow the only road to the gas station. Turn right at that corner, and then left on first gravel road, Little Tribune Bay Road. In a few hundred yards you reach the ocean, and Grant's house is on the right, 5130 Little Tribune Bay Road. Grant's home phone is 250-335-1384. John's is 250-335-0470. Paula's is 250-335-0820. 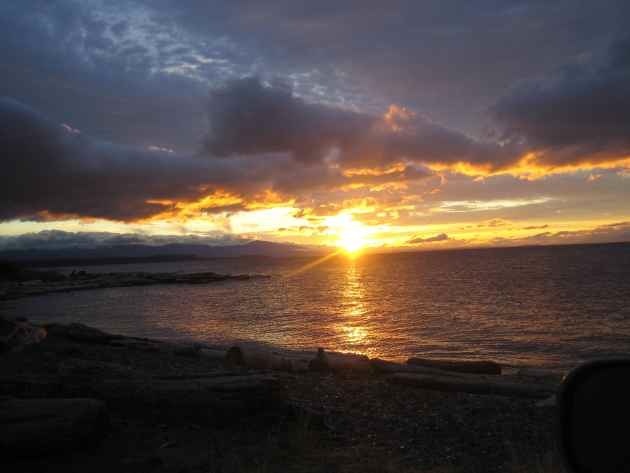 Alternatively, the next easiest choice is to fly to Victoria on Vancouver Island, and rent a car or take the train or bus up to Buckley Bay near Courtenay. Victoria in my opinion is the most beautiful and human-friendly city in North America. Note that if you arrive after 6PM, our Hornby ferry is closed for the night (except on Friday's when it goes to 10PM), and you'll have to stay either on Denman island or in Courtenay. If you drive, the highway takes 3 hours, or you can take the coast road which is a lot slower. The exit is marked off the highway, or you drive right past it if you take the older coast road. If you plan on the bus or train, you will need to schedule your plane and bus trip carefully. The Greyhound bus number is 1-800-661-8747. The train up Vancouver Island leaves Victoria at 8:15AM and arrives at the Buckley Bay ferry terminal at 12:31PM (it's a beautiful milk run, lots of stops on the way). Roundtrip cost for the train is $53.50CN($36US) a week in advance or $81.32CN($60.20) not in advance. The last of the easy choices is to fly into the Vancouver airport and rent a car. Due to the cost of ferries and busses or car rentals, I doubt if you'll be able to save much if any money over flying directly into Comox, especially if you're pressed for time. However, if you rent a car, you have several fascinating options, especially if you're taking several extra days to explore. You can take the Tswassen ferry to Victoria (and explore the most beautiful city in North America in my opinion), or stay on the mainland and go up the Sunshine coast. This is a spectacular trip that takes a minimum of a day, because of the three ferries you'll be taking to even get to the ferry terminal at Buckley Bay. Be sure to buy the circle fare for the ferries, as they package all of the ferry rides into a more inexpensive package (about 4 ferries not including the ones that start at Buckley Bay to Hornby Island). The phone for the Vancouver Island ferries is 250-386-3431 (or toll free in BC 1-888-223-3779), and the phone for getting a guaranteed reservation for additional cost is 604-444-2890 (or 1-888-724-5223 toll free in BC). Plus, as the summer progresses, the ferries can fill up and cause you to have to wait one or two sailings if you don't pay extra for reservations. Cost is a bit variable as the season changes, (note that it is a lot cheaper on the first and last runs of the day) but for just the Vancouver to Nanaimo (or Victoria) ferry it is about $35CN ($26US) one way. 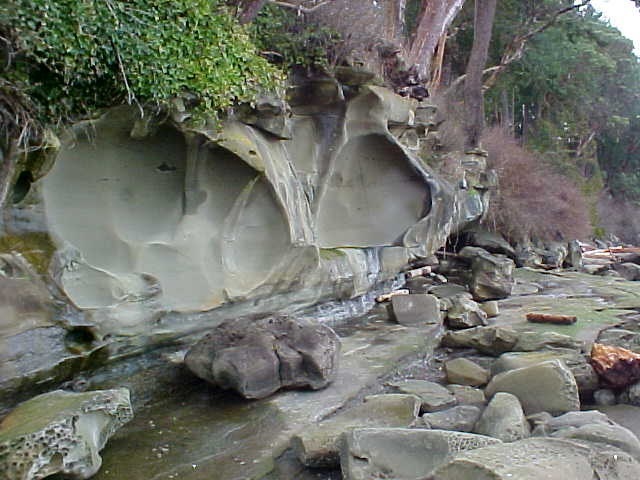 Hornby Island is made of sandstone, and the ocean carves it into amazing shapes. The most complex choice is to fly Vancouver airport and take a bus. It is possible to do, but scheduling can be a nightmare (not to mention ferries running behind schedule or traffic snarlups in Vancouver), and you'll probably end up staying in a hotel to make it work. Chances are you won't save any money because of all the extra travel costs. After flying into Vancouver, if you have a lot of luggage, you take the airporter bus ($12CN o/w or $18CN r/t) into Vancouver to catch the Greyhound to Nainaimo then to Buckley Bay ($41.25CN o/w in advance or $57.25CN o/w). If you have minimal luggage (you don't need much here! 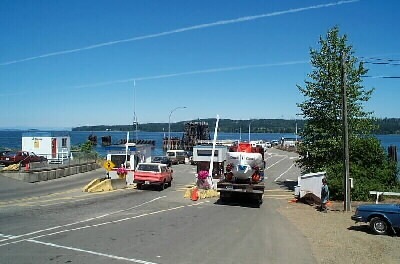 ), take the city bus directly to the Tswassen ferry terminal. Catch #424 (Airport Station - leaves every 8 minutes) at Level 1 Domestic Arrival/departures. Transfer to #620 (Tswassen Ferry - every 30 minutes). The ferry leaves from the Tswassen ferry terminal to Nanaimo every 2 hours. Bus cost is $3CN - you need exact change. That the Nanaimo ferry - you catch the Greyhound on the ferry. Then to Buckely Bay as above. 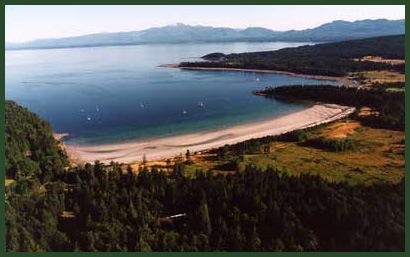 2005: Description of the facilities on Hornby Island, BC, with directions and recommended materials to bring.